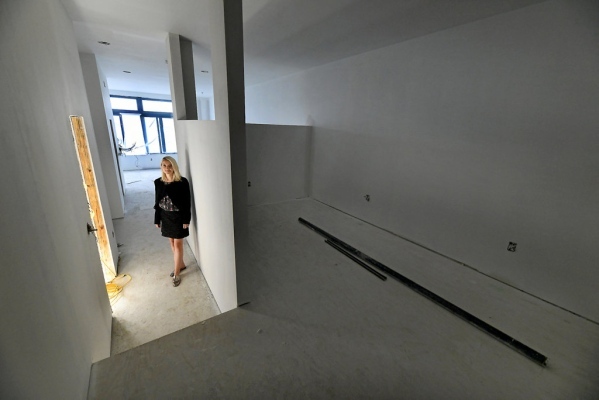 BUTCH COMEGYS / STAFF PHOTOGRAPHER Leanna Skaluba, deputy manager of Samters Lofts at Penn and Lackawanna avenues, stands in one of the lofts under construction on Wednesday. As appeared in The Times Tribune on September 13, 2018 by Jon O’Connell. SCRANTON — The two dozen or so electricians, painters and plumbers are used to seeing Leanna Skaluba weaving around them as she shows off new loft apartments to potential tenants. Samters Lofts at Penn and Lackawanna avenues is still a work in progress, but the developer renovating one of the latest historic buildings to be converted for high-end living already filled half of the available units. Skaluba gives tours almost daily and keeps handy a tote bag filled with hard hats. Tenants should be able to move in as early as Nov. 1. Apartments on the fifth floor are nearest to completion. On Wednesday, workers mixed skim coat and spackle. One tiptoed on three-foot stilts with a trowel and globs of joint compound that he deftly scraped into a corner. A number of historic fixtures will remain, including the iron support columns on the first and second floors. Foreman Eric Tencza said workers will try to preserve custom wood paneling in the stairwell hidden by layers of building material added over time. Preserving the structure’s old bits always presents a challenge when builders have to work around them, said developer Charles Jefferson. “That’s the minus from the developer’s standpoint, but the plus is you get some real killer units,” he said. The old department store’s original elevator, built by the former Gurney Elevator Co. in Honesdale, still glides between floors with near imperceptible movement. It’s being renovated with modern fixtures, but the mechanical guts are the same. Apartments, from the second to fifth floors, can be occupied before the retail units are done, Jefferson said. The tenant entrance on Penn Avenue and lobby will be complete while workers finish the retail spaces. Sweet Lush Cupcakery, a popular Dunmore bakery and cupcake truck decided not to occupy one retail spot after the business owner changed her mind, Skaluba said. Beyond the square footage and six different apartment floor plans, each one gets the same appliances, including a laundry machines, furnace and hot water heater. The lofts, ranging in size from 491 square feet to 980 square feet, cost between $875 per month for the smallest and $1,450 for the largest. Builders are knocking out eight large windows on the exterior wall facing West Scranton, two on each floor, to allow more sunlight. BUTCH COMEGYS / STAFF PHOTOGRAPHER The front of the Samters Lofts building under construction at Penn and Lackawanna avenues in downtown Scranton on Wednesday. On the fifth floor, in one room waiting on trim and appliances, there’s a more sweeping view of West Side and the mountains than drywall. 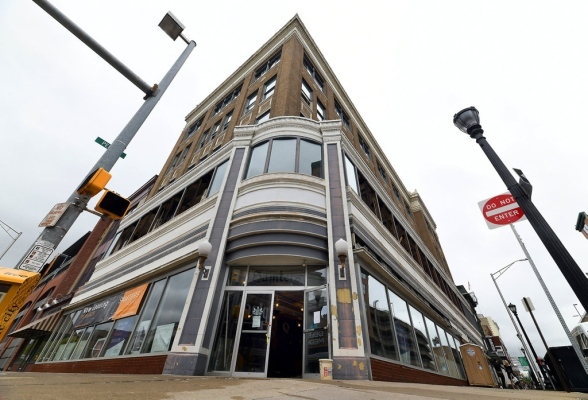 The giant “L” that is Lackawanna and Penn avenues has seen some dramatic improvements as a small cadre of developers flip aging buildings for retail and residential purposes. They are catering to young professionals, many of whom work for the hospitals and colleges in the city, who can afford higher rents and prefer to have food and entertainment within walking distance. Jefferson tips his hat to Marketplace at Steamtown owner John Basalyga for bringing unique vendors to the mall, and developer Art Russo for composing the right mix of restaurants on Penn Avenue’s 300 block.